gaugeART Video Gauge Adapters can be used with any display that has an available video input port. There are three video input ports commonly found: VGA, composite, or HDMI. gaugeART Video Gauge Adapters use a VGA port and displays with a VGA input port will provide the best quality. Displays with HDMI inputs will provide the next best display, and finally, most displays include composite input however, the quality is lower than HDMI or VGA inputs. Using an aftermarket in-dash navigation stereo display: most aftermarket navigation stereos offer a composite or HDMI input. These displays will require a composite or HDMI converter (recommended options listed below). 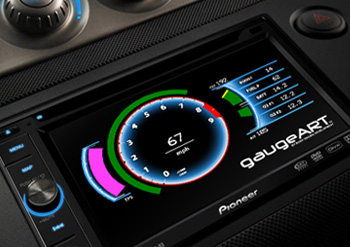 Many stereos will allow music to be played along with the gaugeART gauges being displayed if they are connected using the “reverse camera” input (this feature should be confirmed with the manufacture). HDMI inputs generally will now allow music to be played while the gaugeART gauges are displayed. It is important to remember that due to the limitations of composite video signals, the quality of the display will never be as high quality as a display with a native VGA input. HDMI inputs will give a very high quality display but its important to remember that you will not be able to listen to music while your head unit is switched to HDMI. Recommended converters: The following converters have been tested with gaugeART products. We designed this composite converter with a memorizing feature that will memorize settings such as screen position, when you car is turned off. Other converters do not offer this feature. Note: some in-dash navigation stereo display HDMI inputs (like Pioneer) are not compatible with the standard gaugeART 800×480 resolution. A 480p (720×480) resolution is available in gaugeDesigner for customers with these stereos.